The fact that the ages of Miss America over the years is strongly correlated with deaths by steam in the same number of years, doesn't mean anything. The data is strong and yet, it has no predictive value. This is why looking at the patterns of past stock performances (even over a ten year period) does not guarantee any kind of information into the future performances. It's also why financial experts, like Burton Malkiel in his seminal book, A Random Walk Down Wall Street, which chronicles some of the financial collapses of our time, recommend diversifying your portfolio to mitigate risks. 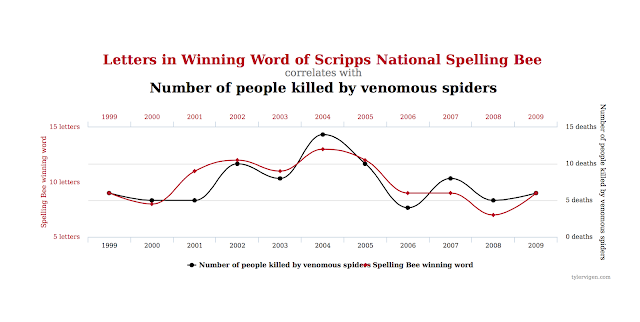 Correlation does not equal causation and there's a danger that in looking to make patters in our data meaningful, we'll end up creating meaning where there is none.